Thailand is among the most talked-about destinations on the planet, though what people have to say varies dramatically. Some travelers come home claiming to have found themselves on long, white-gold beaches; others turn up their noses at the Thai islands, claiming they’ve been overrun by backpackers. Still others rave about the diving, mountain scenery, and world-class cuisine — it just depends where you go. Whether your interests align more with nature or culture, early mornings or late nights, the Land of Smiles has something for every type of traveler. From dazzling coastal resorts to bustling interior cities to quiet spots up north, these are the top places to visit, or discover, in Thailand. It’s easy to be thrifty in Thailand, where penny pinchers can get by on $25 a day, and $100 a day gets you a good deal of luxury. But go for broke on the nation’s largest island and you’ve got a shot at actually, well, going broke. Phuket’s reputed nightlife draws gaggles of go-go bar-goers to the west coast, but away from the intoxicated crowds are some of the first, and best, luxury resorts in the Thai islands. Big spenders and careful savers can rub elbows with celebrity jet setters at Amanpuri, Rosewood, and other luxe properties, running up a tab in spa treatments when they aren’t lounging at bougie beach clubs and dining out at pricey seafood restaurants. There’s a case to be made that Chiang Mai deserves the Thai foodie crown with its streetside barbecue carts, slurpy noodle soups, and fresh markets open day and night. 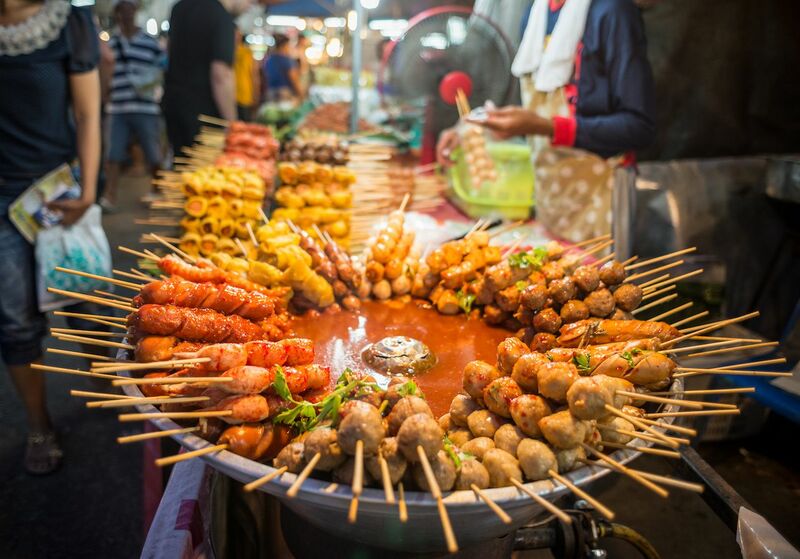 But nothing beats the variety in Bangkok, from its legendary street food to its buzzed-about haute cuisine, both of which have earned the city Michelin stars. Thailand’s capital quite literally caters to every type of eater: Big appetite but little budget? Follow your nose down Chinatown’s Yaowarat Road or queue up for one of the crab omelettes that made chef Jay Fai the queen of sidewalk dining. Big appetite and even bigger credit card limit? Treat yourself at Bo.lan or Le Du. Then, when you’re one more bite of coconut curry away from bursting, fill your time with cooking classes or tours of Bangkok’s famous floating markets. Elephants are undeniably adorable. No one would blame you for wanting to get up close and personal with the sweet, sensitive creatures, but more often than not, the elephant experiences in Thailand are exploitative and incredibly harmful. Thankfully, ethical wildlife tourism is a growing trend in Thailand, shifting the focus to rehabilitating the animals rather than entertaining tourists. Chiang Rai in the nation’s far north has two excellent options for responsible elephant interactions. At the Elephant Valley sanctuary, visitors can observe elephants playing in a natural habitat and even volunteer to help. 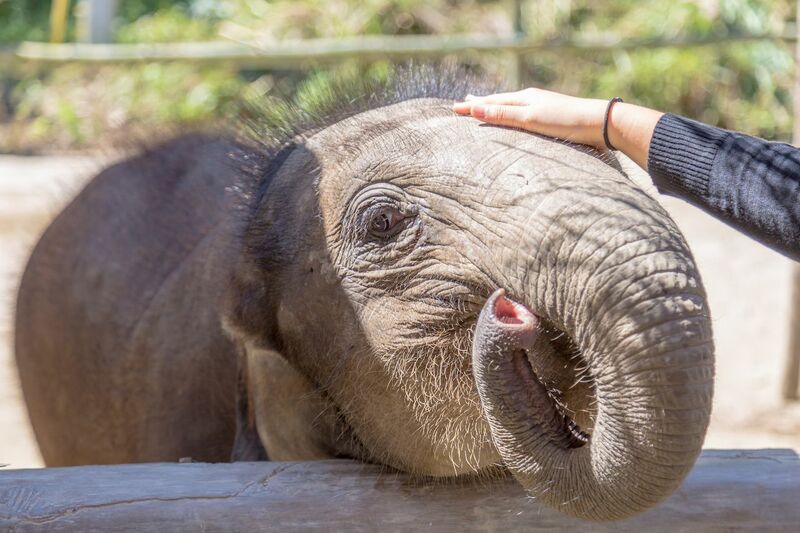 Another way to go is booking a stay at the Anantara Golden Triangle for ethical encounters with elephants that have been given a second chance, led by mahouts who deeply love and respect their big-eared buddies. Even if you can’t make it there in person, consider sponsoring an elephant as your good deed of the day. Koh Lanta is perfect for backpackers that go around apologizing for the backpackers on Khao San Road. 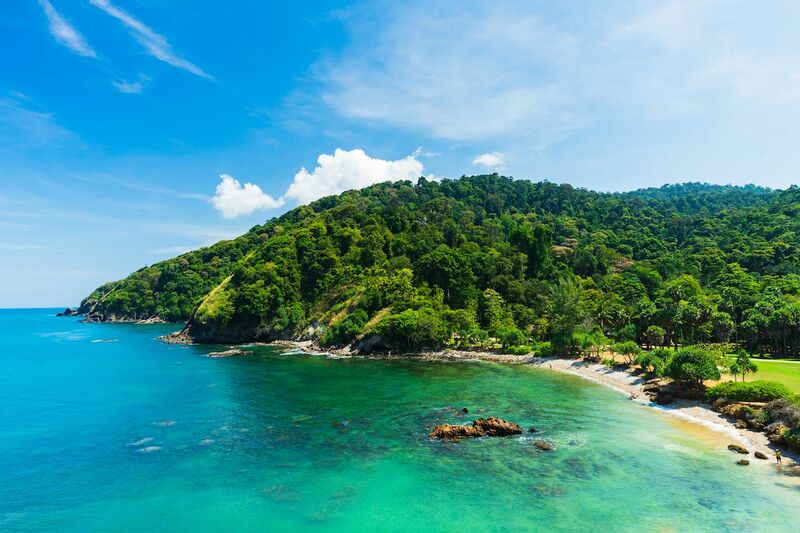 Technically a 50-plus-island archipelago, Koh Lanta typically refers to the big island, Koh Lanta Yai. Its miles-long shoreline off the coast of Krabi takes some effort to reach, deterring the hyper-rowdy, Singha-beer-slinging crowd. Stick to the island’s west coast to sleep, eat, and low-key party, but travel south for the most remote beaches. No longer exclusively for beach bums, Koh Lanta has a range of accommodations, but it’s as easy as ever to find a modest guesthouse or decently priced bungalow with all the important amenities but no extra frills. 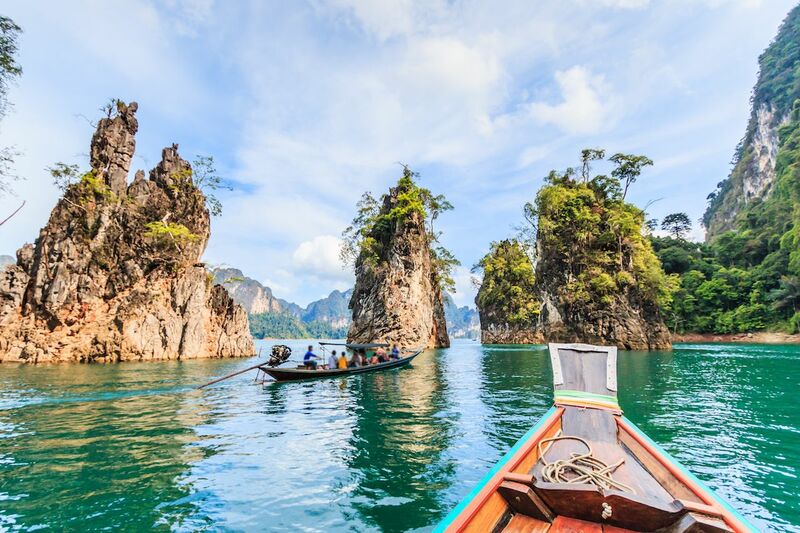 Khao Sok National Park in southern Thailand hosts one of the world’s oldest rainforests, said to predate even the Amazon. The park’s impressive biodiversity is heavy on hefty land mammals like elephants, boars, bear species, tapirs, monkeys, and marbled cats, whose habitats weave between thick tree canopies and lush jungle, punctuated by karst mountains and the stunning Cheow Lan Lake at the heart of the park. Unplug on a four-day rainforest safari, three-day jungle lake safari, or two-day jungle safari for activities like hiking, canoeing, and bird-watching alongside cultural perks like dance performances and cooking demos in the evening. 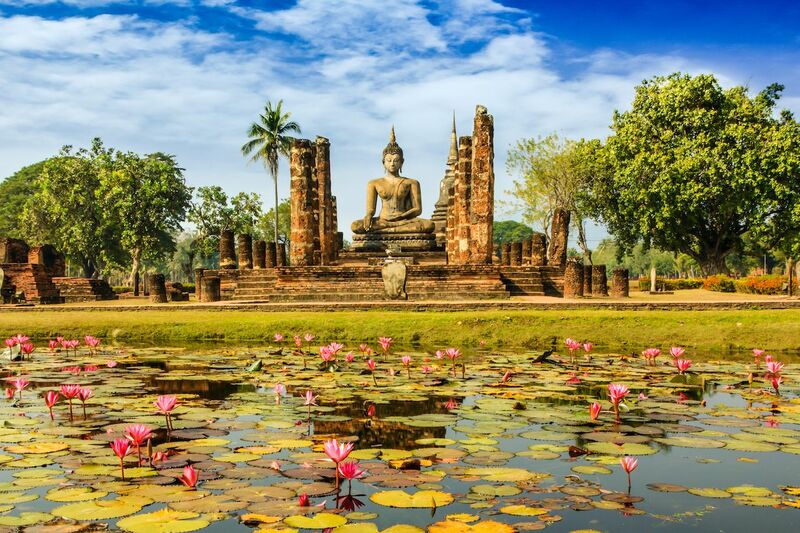 The historic centers of Sukhothai and Ayutthaya have both been recognized by UNESCO for being the first and second capitals of former Siam, respectively. Sukhothai dates back to the 13th century when Thai culture was coming into its own and has a temple-filled historical park to prove it. Ayutthaya flourished between the 14th and 18th centuries when it was eventually sacked by the Burmese army. Though the site was never rebuilt, what remains is an impressive display of towering stupas and architectural ruins, evidence of its glorious past. Neither has much going on for a multi-day stay, so plan on squeezing one or both in as day trips. Ayutthaya is easily accessible from Bangkok, roughly an hour away by car. Less convenient but just as historic, Sukhothai sits between the Thai capital and Chaing Mai, about six hours away from both, making it a good place to stop if you’re moving between the cities. Krabi’s limestone cliffs are more than just a scenic sales pitch. 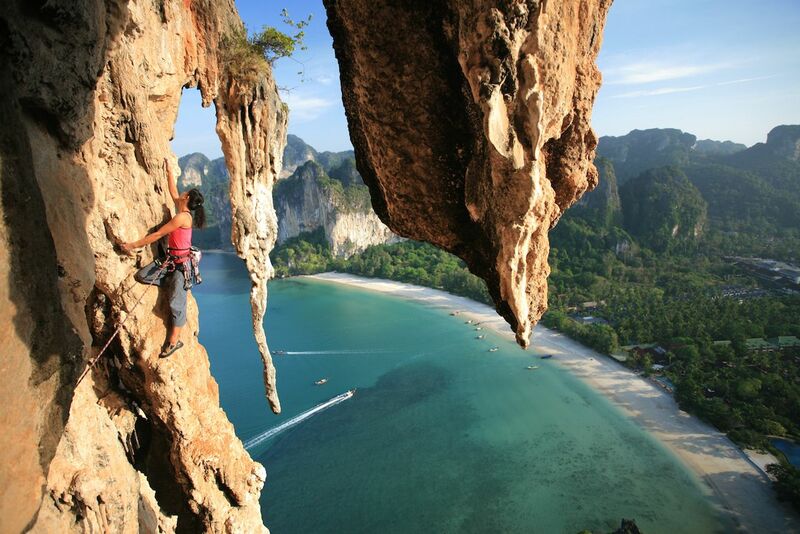 They’re also the talk of the town among climbers in Thailand and across Southeast Asia. Pro cliff scalers beeline for the hundreds of bolted climbing routes around Railay Beach to mingle with the resident monkeys and get aerial views of the reef-studded Andaman Sea. While the routes are advanced, amateurs are in good hands with the many climbing schools set up in the area. A cluster of 11 islands in the Andaman Sea, the Similan archipelago is replete with reefs and aquatic wildlife so precious they’ve been protected as a marine park since the 1980s. February through April is the best time for divers, especially those looking to see whale sharks and manta rays, but the dive season extends all the way from late October to early May. 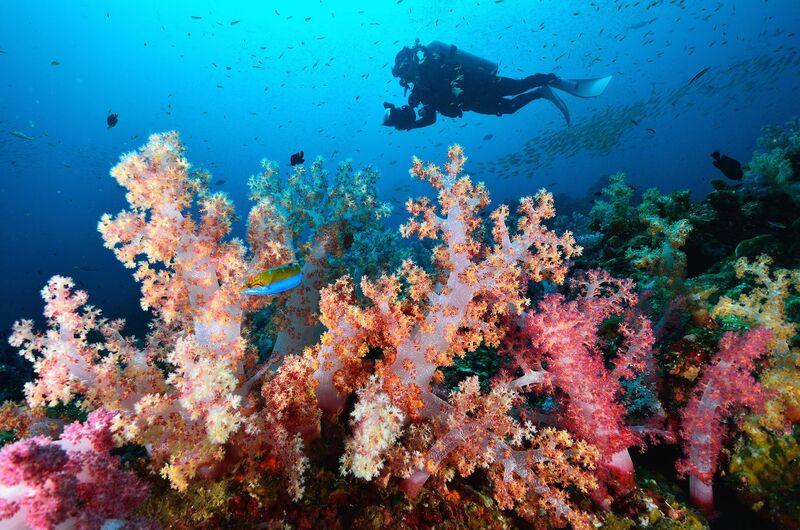 PADI Travel recommends booking a liveaboard dive trip, but those looking to take their underwater romps one day at a time will find the easiest and most frequent dive-boat departures from mainland Khao Lak, a string of villages a couple of hours north of Phuket. Thailand wouldn’t be the destination it is today without its reputation for waterside rages, much to the chagrin of many locals and other travelers. If your idea of a Thai vacation starts and ends with buzzwords like “ping pong shows” and “massage parlors,” head for Pattaya southeast of Bangkok. The nightlife is insane, promising neon-lit discos and raucous beer bars, sizzling gay clubs and buzzing cabarets, plus massive backpacker and expat communities that have already scoped out all of the naughtiest spots. For actual Full Moon Parties — the world-famous beach blowouts fueled by fire dancers, druggy debauchery, and ravers dressed in little more than glow-in-the-dark body paint — set your sights on the one and only Koh Phangan. 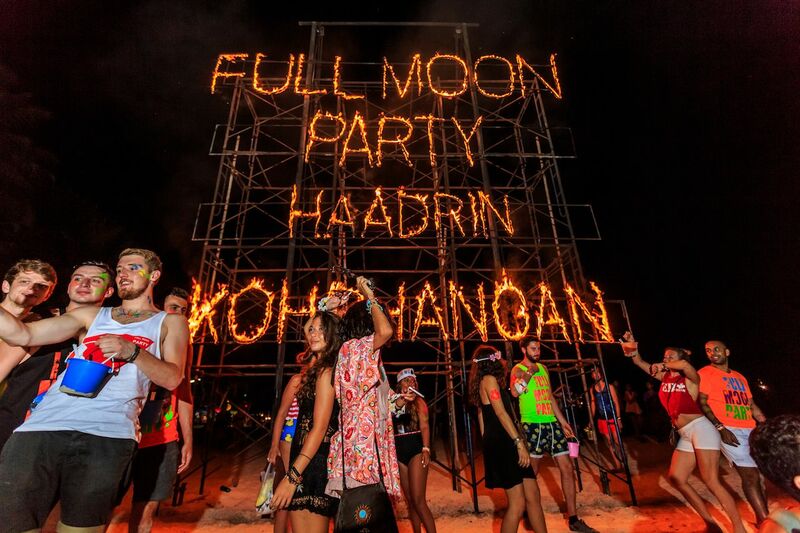 There’s a Full Moon Party every month thanks to the lunar event that the all-night extravaganza loosely honors, so no need to worry about FOMO here. Thailand isn’t huge to begin with, so when you take away all the places famous for adult activity, the options for parents with young kids narrow like the country’s skinny southern peninsula. Surprisingly, a safe bet for a G-rated vacation is one of the largest, most populous, and most dynamic cities in Thailand: Chiang Mai. 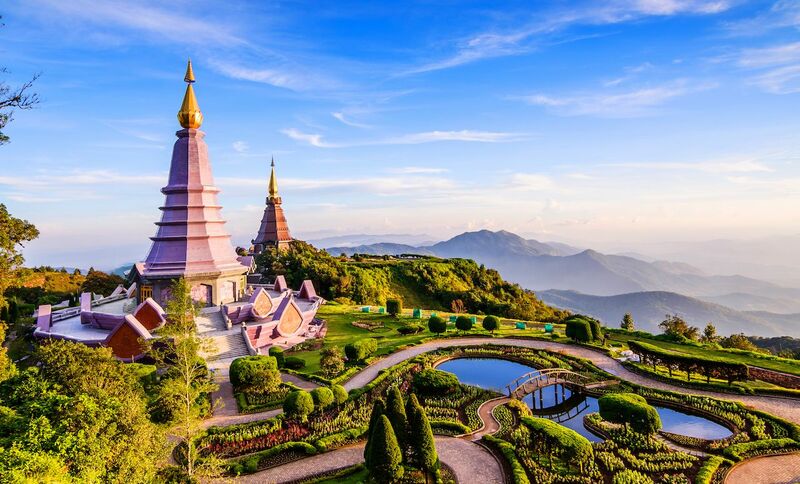 Located in the hills of northern Thailand, Chiang Mai sees a lot of foot traffic, but those driving the tourism tend to prefer family-friendly activities like hiking and temple tours. With a solid tourism infrastructure already in place — suited to travelers from all tax brackets, no less — parents don’t have to deal with hassles of visiting a remote mountain town but can just as easily avoid the admittedly present backpacker scene. Getting around is easy; delicious eats are plentiful; and activities like cooking classes, souvenir shopping, and wildlife encounters are easy to arrange. At a glance, Hua Hin looks like any other beach resort with a fair bit of development. An early resort for foreigners that’s become more of a weekend hangout for Thai travelers, Hua Hin appeals to anyone interested in good golf or great seafood, but above all else, it’s known as a relaxation center. We can thank Chiva-Som for that. 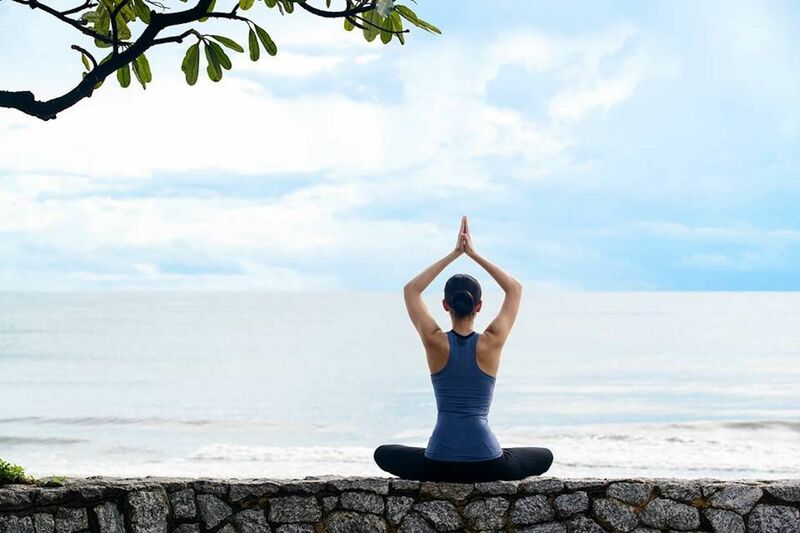 The wellness resort has long been frequented by stressed-out celebs looking to unwind with its detox programs and rejuvenating retreats, yoga and fitness offerings, and long list of spa treatments, which range from bamboo and herbal massages to acupuncture and skin-smoothing facials. There are several other spas in town as well, so you’re guaranteed to find serenity that suits your budget. Couples everywhere dream of tying the knot to the thrum of lapping waves, toes buried in fine white sand while the tropical sun beats down. 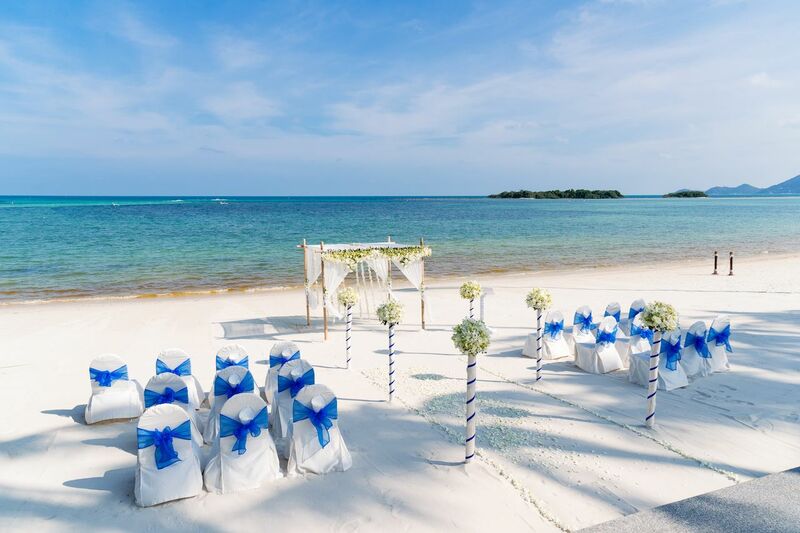 The ideal beach-wedding destination needs a choice of romantic venues and plenty to do outside of the scheduled nuptials without being so popular that beachgoers become unwitting wedding photobombers, all at a flexible price point that justifies flying across the world. Koh Samui delivers on all counts. Plan on getting hitched between January and March for the best weather, and let the island’s seasoned wedding planners take care of the rest, whether that’s a luxurious Four Seasons reception or low-key beachfront ceremony. 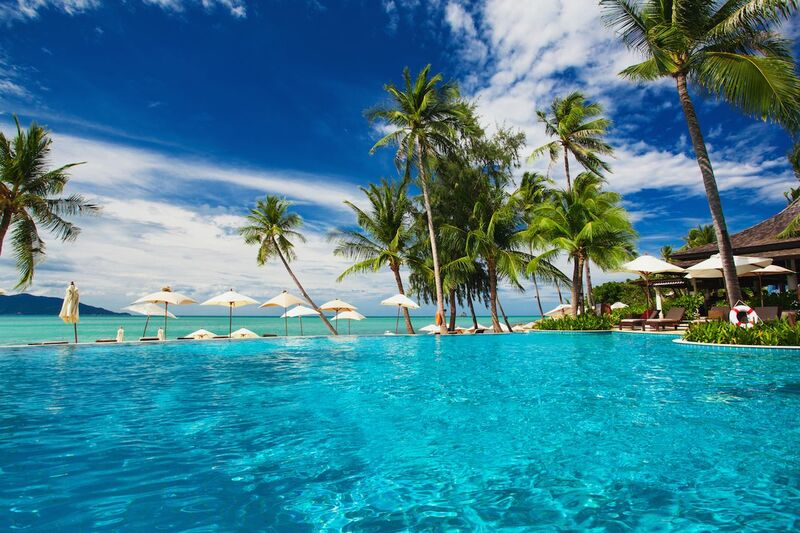 In between celebrations, you and your guests can enjoy Koh Samui’s wealth of indulgent dining, relaxing spas, water sports, or maybe even a little nightlife. And the best part? You already have your honeymoon destination in the bag.